When I was a teenager and trying to learn about Japan, other cultures, and different ways of thinking, I read a Zen parable referred to as "The monk and the strawberry". In this parable, a monk is out walking when he encounters a hungry tiger. As he backs away from the tiger, he finds he is now on a cliff outcropping with nowhere to go. As the tiger approaches, he stumbles over the edge, grabbing a vine. Hanging from the vine, he notices two mice, one black and one white, nibbling at the vine. Contemplating his fate -- tiger or vine -- he sees a single strawberry growing nearby. The monk plucks the strawberry. The story concludes "how sweet it tasted!" At the time, I thought it was absurdist. Today it is raining in Tokyo. Most people will tell you this is a story about "enjoying the moment", or how one can find beauty even in the most dire circumstances. 20 years ago, I would have said "yes, clearly, that is what the story is about." I spent the day in meetings, with colleagues old and new, catching up, working on plans, celebrating, griping. The things one does in business meetings. Interspersed were visits to a conference room reserved as a workspace for my group. But I was the only one there, and in the hot, electrical office air, I gazed at the plastic chairs, cables, whiteboards and marveled in a jet-lag trance at the blankness and emptiness of it all, as my fingers clicked away on my laptop. Last night, returning to the hotel after a delicious ramen dinner, our female cabdriver concluded transit by handing each of us a small berry-shaped candy as she thanked us for riding with her. A perfectly kawaii detail. As I pocketed the candy and entered the hotel, I thought of the parable again. A wise Zen writer argues the parable is about the opposite of what you think. It is, rather than being a celebration of "pleasure in the moment", a cautionary tale. "The moment's pleasure certainly dooms the monk through distraction. What an idiot [the monk is]." Life is danger and suffering, and forgetting that for a few moments of bliss is not a good or enlightened thing to do. I think of the news. Whether at the public or personal scales, tragedy abounds. The world burns, and the air is choked with its ashes. And if it is not our homes burning, the smoke from others' gives us migraines. Death takes shots at the people we know. It misses some, grazes others, and takes the rest down. I consider the conversation I had with a colleague over lunch, about how their attitudes about what "success" at their job meant had been changing. I indicated that mine had, too. As we talked, I wondered if I was just getting very good at justifying my own actions, or if I was actually learning something. The rain pours down in Shinagawa. I step carefully across the wet gray stones of the plaza, trying not to slip. Perhaps great ambition is a luxury afforded to those without fear, or those without knowledge of what they have to lose. Or those who think their actions will matter, in the grand scheme of things. Because they haven't yet met the tiger, or aren't yet hanging from the vine. The fortune pinned to my board at work reads "Just to be alive is a grand thing." I rub the sore spot on my face. Probably just a stone in my salivary gland. Getting older, I see the value of the things I have and the things I have lost. Everything about our lives is so fragile, so temporary. So imperfect. So perfect. Tokyo is beautiful in the rain, and unseasonably cold. In my jacket pocket, the berry candy rolls around in its plastic wrapper, uneaten. You remember this place. Los Angeles. You wonder if it remembers you. Cities should be able to do that, right? Seems fair. After all, you lived here for a lifetime. Paid taxes. Loved its streets and skies and parking spaces. Ate in its restaurants. Cried in its parks. Studied its outlines in the Thomas Brothers guide. Even played a few shows in its clubs. Most of those clubs are gone now, and the rest practically museums. Your car drives you past the bleached bones of what was once the Coconut Teaszer [sic], en route to a meeting with a media-related agency doing business in the echoing carcass of the Directors Guild of America building. "Drive West on Sunset...". You think of Walter Becker's recent passing. You look around. You've been up and down this part of town many times. It's hard to recognize now, with new construction, new facades, new tenants. Strangers replacing the buildings and businesses you knew, and the ghosts of their memories vanishing in the perfect fall gloom. Your hotel didn't even exist 3 months ago, let alone 20 years ago. It's down the street from an old, storied Hollywood building. You used to go to that building for singing lessons, where David Gabriel gave you a voice and confidence. Long ago, too late. But you've still got that. You wonder where he is these days. You'd like to thank him. The windows are dark. Maybe it's being redeveloped or re-sold. So many other places are. The Opium Den? Gone. You walk by its now-anonymous door, thinking of how many times you've found great parking here, waited in line, seen bands and met friends and went home buzzed and reeking of cigarette smoke. There was a time people could smoke in bars, until suddenly, overnight, that stopped. Nearby Sunset still has some of the old landmarks, even if they've been rebranded for ridiculous dot-coms, news networks, or some kind of modern coffee/yogurt/spin class/boutique you can't quite figure out. A far cry from the all-but-endless strip malls. Everything used to look like an off-brand 7-11, and now it all looks like a cross between Virgin America and Starbucks, tasteful purple lighting and wood. You wonder why coming back here makes you feel so melancholy, as you glance north towards the Hollywood Hills and Beachwood Canyon. You had some good times here, when the weather was just like this, the nights perfect for walking, laughing, getting one more drink, driving across town to see your friends play somewhere. Maybe it's just a reminder of how much older you are, and reinforces how fragile life is. You think of Tom Petty, gone too soon. "Oh baby, don't it feel like heaven right now? Don't it feel like something from a dream? Don't it feel like tonight might never be again? We know better than to try and pretend..."
It's funny. It's barely 10:30 pm. You notice as you're walking through the upgraded and renovated streets that most of the hip-looking bars, restaurants, and clubs are all but empty and/or closing. They all look nice -- much more expensive and richer than when you lived here, and yet, they're all turning in, closing for the night. Like you. Is it that they have given up on the possibilities of the evening? Or that they just know better, because it's Wednesday night and everyone's got work in the morning and the weekend seems far away? Or is that just how they roll now, all early to bed and responsible and iron discipline and safety? Like you? Hollywood Boulevard is still sketchy, between its higher-dollar outposts. You keep an eye out as you stroll on, stumbling over the cracks in the Walk of Fame. Your phone plays one of the last songs you wrote here. You think "this sounds better than I remember". After dinner you found the CEO and told him that even though you hadn't worked closely together, you appreciated his efforts and thanked him. Surprisingly, he stood up, looked right into your eyes, and gave you a real, non-show-biz hug. Looking back at him, you had a brief flash that he, too, was evaluating his life here in L.A. as he considered his second act. You pass the banks and the bars and closed clothing shops and loop around. Not really looking for anything, just enjoying being here for the moment. It's quiet and as beautiful as Sunset and Hollywood get between the day's heat and the relentless pummeling of the night's music. There were reasons you stayed here for as long as you did. And reasons you left. No regrets. If anything, the opposite. But still. You stand amidst the tangled, looping paths that make up the city's grid and consider how they took you where you wanted to go if you could figure them out, or got you lost, or left you fuming in traffic. Or brought you home. All those streets and vectors don't just outline the city, you think. Those roads, those choices, those outcomes, they are the city. Thank you, Los Angeles, and good night. I have not been writing much here, as a glance at the past posts widget will tell you. Since exiting the digital music business, I haven't felt a need to write much about it. From my perspective, not much has changed, and there's no new insights to be proffered. Some big artists withhold their new albums. Some do windowed releases. Some add or re-add their catalog. Services go out of business. Every service is still struggling, except for the ones part of big giant public companies, who are happy to fund them as part of deeper and longer strategies. My current employer is not fond of employees commenting publicly at all, even when they are acting as private citizens or not in official capacity. As a result, I have not (and likely will not) blogged about virtual reality, augmented reality, or any other related technology. Bigger picture, the current state of politics, debate, and discussion is so debased, I feel that it is all but impossible to have any real conversation around issues of substance. Facebook is filled with garbage of various flavors. People on the right are not going to change their minds. People on the left tell me they are exhausted and don't need to hear from people like me. I don't need to contribute to the outrage culture. I have used my writing as an outlet for my creativity, but other projects have been consuming that as well. I hope to get back to writing, at least for my own self. I find myself arguing points that any mature, educated adult should not have to argue. I have to tell Trump supporters that torture is immoral, illegal, and ineffective . These points are indisputable (if anything, torture provides opportunities to recruit for "the bad guys). And they respond that they don't care about any of those things, and that they "believe in torture." After that, it is difficult to accept anything else these people have to say. Particularly disturbing is these aren't all crazy-eyed John Birch Society gun-wavers. These are soccer moms. Students. People who should know better. But when they advocate torture, I cannot see them as anything other than selfish, soulless, and hateful. Their avatar, Mr. Trump, has said he is in favor of torture because "they probably deserve it". This is a morally bankrupt position to take, and indefensible in every way. It is not something that any thinking or feeling person can debate. If our values include torture, we are in the wrong and our values are not worth saving. The New Left has its own problems to wrestle with, or perhaps I should say "punch in the face". The current fashion is to argue that we should be punching Nazis in the face at every opportunity. The justifications for this rely on a semantic shell game (as do some other New Left arguments), conflating those who espouse disgusting neo-Nazi views with actual Nazis invading Poland, building concentration camps, and engaging in a world-wide war; and engaging in the current practice of "just kidding/not kidding" intent-flipping. At least in America, our laws and culture articulate that people are allowed to speak freely (with a few narrow limitations). And that this idea -- that our society tolerates speech that we might find offensive -- is something that makes us strong. Without the freedom to express your ideas in words, written or spoken, society cannot evolve. For that most part, that evolution has been in a positive, more progressive direction. But not always, like anything. "Progress" is not always a straightforward endeavor. Assaulting someone on the street while they are talking is wrong. Committing violence against someone for their ideas is anti-Democratic. It is contrary to our fundamental values as a nation. There is no exception in free speech (legally or morally) for "when you disagree with them". That is part of the challenge with free speech -- you can't carve out the speech that you don't like, while insisting that everyone else has to accept yours. As many have noted, freedom of speech does not mean freedom from consequences. Those consequences can include ostracization and wide dissemination of the fact that you said or did these things ("Hey, did you know Jane articulated neo-Nazi values?"). It can also mean that speech becomes part of the official record of the courts or government. Or that others can make recordings of same and put them up on YouTube or WorldstarHipHop or CNN. In many cases, real-world offensive speech can result in physical violence. Walk into a bar, start calling people names, and you're likely to get punched in the face. Mouth off to a cop, see how that goes (sadly). Be nasty to a woman, get slapped. However -- and this is critically important -- violence as the first response to speech is indicative of weakness and failure of reason for the listener more than it is the offensiveness of the speaker. For a long time, society considered those who responded to speech with violence to be lacking basic self-control or dignity, operating on a hair-trigger. When we resort to violence as a first response to someone else's ideas, we effectively state that we have no argument, alternative or retort to the ideas being put forth. We say we are afraid of the ideas. Put another way, I'm comfortable letting neo-Nazis talk, because I believe the neo-Nazi ideas are disgusting, powerless, and absurd -- and everyone exposed to those dumb ideas will see that. Perhaps a few wackos and losers will adopt them, but so what? There will always be some flavor of hateful and ridiculous ideology out there for people like that to embrace, and we will always counter and defeat it with better, stronger ideas. And if we cannot trust in the robustness of our ideas and our rhetoric in the face of darkness, evil, or just some other competing ideology, it suggests a much more significant problem with our beliefs (or at the very least our way of "marketing" and delivering them) might be lurking. The Westboro Baptist Church engaged in some of the most inflammatory and distasteful displays of free speech I can think of (short of people advocating for child molestation, and, yes, neo-Nazis). And yet society still felt physically assaulting them was largely inappropriate, or at least not celebrated to the degree our current moment has been advocating punching Nazis. Perhaps the neo-Nazis are an appealing target at the moment, because, aside from being loathsome and taboo, they're embodied by the only allowable out-group for the left: white men. That particular demographic allows the left to say "anything goes", because everyone hates Nazis, right? You're with us or against us. Ask yourself how you'd feel if the video was of someone punching a Muslim cleric (even one who was known to advocate Wahhabism, or had endorsed terrorist attacks). Or punching a woman who happened to be identified with the alt-right (for example, Kellyanne Conway). Or someone on whichever side of the Israeli/Palestinian conflict you disagree with. Or an abortion doctor. Or someone protesting abortion. Making an exception for violence against certain speech and ideas is dangerous, because what happens next is what always happens in these situations: anyone who disagrees with the ruling dogma gets labeled a ____ (by definition! Because "we" are anti-____). Or a ____ sympathizer. Or just someone who looks like a ____. Then they're fair game. Here comes your beat-down. Over the last decade, our ideas of speech have been deliberately made murky by various parties. The internet and its apps are speech. Money is speech. Marches are speech. What isn't "speech"? There are even people advocating liberal or left-leaning values who are bringing reactionary thinking and Orwellian philosophy into the picture, They claim destroying property (by smashing it or burning it) is not violence (as long as it isn't yours). It, too, is speech. And sucker-punching people isn't violence. It's "speech." If that is speech, what is violence? In some people's views, speech is violence. To say the wrong things, or even say the right things using the wrong words, is violence. They say "words hurt" and that speech can "seem like an assault" or "feel threatening". Yet instead of responding in kind, with their own nasty speech, the proposed solution is the aforementioned physical violence. So in some contexts and arguments, actual speech is "violence", and actual violence is "speech". There is a huge difference between someone espousing hateful ideas and someone committing actual physical violence, as anyone who has experienced both will tell you. "Sticks and stones..."
We erode that distinction and clarity at our own peril. A minor diversion. The current societal moment also likes to chastise people for the words they use, absent original context and intent, amidst shifting definitions. As an example, the word "racist" now has different meanings depending on the people you're talking to, and the chasm in those meanings is being specifically exploited as part of the current political discourse. It used to be that "educated" people wouldn't use what they referred to as the "f-word" in polite conversation, in art, and certainly not as part of public discourse. Now, the "f-word" is not only no problem, but failure or refusal to use it marks you as some kind of fuddy-duddy (or perhaps f-word duddy.) But if you use the "n-word" in any context (assuming you're not part of the group "allowed" to use it), you will be in big trouble. There is something almost quaint about the idea that some words can still shock, and still have that kind of power. I say "almost" because more than quaint, I find it ridiculous and arbitrary, or perhaps more accurately an indication that words, language, and society continue to evolve and change. Maybe we shouldn't take it so seriously, or at least recognize that speech we deem "offensive" can be ignored, or says more about the speaker's deficiencies than our own. Context and intent also matter, and perhaps matter more than the actual words. The words themselves have no meaning or power. It's how they are deployed. It's like if people started using the word "pickle" as a hateful term for people of color. You get upset about the intent and the context, not the word. No matter what words someone is actually using, if their intent is to hurt, they're in the wrong. This works the other way, too. Certain people jumped all over Steve Martin for a tweet he shared after his friend Carrie Fisher died. Rather than accepting and understanding that he was grieving for a a friend and saying nice things about her, they chose to ignore the context and intent and focus on policing speech. Even if you believe Martin or his choice of language were sexist or representative of the patriarchy or whatever, is this really the best target to pick here? And the best time? It is clear to everyone (including the Speech Police) what Martin meant and was trying to do. Unfortunately some people saw a rich target for making an ideological point. When people focus on which words you use, instead of what you said and meant with them, every speech or dialog becomes a list of good words to be ticked and bad words to be avoided. And when that happens, the speech you end up with when you do that is bland and empty, "positive" but unable to actually advocate anything for fear of upsetting people. How we do things and why we do them matters as much as, and perhaps more than, the actual results. Winning by cheating isn't really winning, is it? If we defeat our enemies by destroying our values and replacing them with their values, who is the victor and who is the vanquished? We win, but what have we lost? When we adopt the tactics of the brutal because we are convinced we are right and justified, we give in to the trap of "might equals right". We give in to fear. We give in to our worst instincts. We play by their rules instead of ours. That is what happens when we start by punching people whose ideas we disagree with. We go to the dark side. Or Iraq. Maintaining the moral high ground isn't just "nice". It is the thing that makes our cause just and gives us the right to exercise force if needed. It is literally what allows us to be better than and different from those we are fighting. (And I suppose I have to clarify again that I am not talking about self-defense, or responding to individual physical aggression, though depending on where you live, local laws may or may not support you). What is so ultimately disturbing about all of this for me is the Ourobouros these right and left actions forms. This is not some "both sides do it" argument, but rather an uncomfortable parallel. Because when you're fighting Nazis or the out-group or ____ or whatever boogeyman you have, why stop at sucker punches on the street? Based on the logic and justifications you used to start punching, you cannot stop there. Ideological purity demands it. After all, they're evil and we are righteous. What about guns? Assassinations? Blowing up their houses? Attacking their families? Torture? I caught the last 5 minutes of the Grammys -- enough to see Adele win "Best Album" for her record "25" (beating out Beyonce's "Lemonade"), and enough to see Adele's all-white crew on stage. 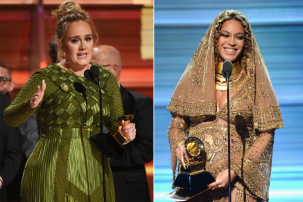 As Adele fought back tears and gave props to Beyonce, I couldn't help thinking that part of why she was crying was the Internet was about to start laying into her for winning and for being #GrammysSoWhite. The world is predictable, sometimes. Let's clarify a few things. "25" was a massive record. How massive? "In 2015, [Adele's] '25', which ended the year as the most popular release by a mile, sold more than the best-selling titles of 2013 and 2014 combined. ...no album has sold at least 7.4 million copies in a calendar year since Usher’s "Confessions" just barely missed the 8 million mark back in 2004. It’s also worth noting that 25 was released in November, so it added up all those sales in less than two months. Adele’s latest blockbuster was responsible for 3% of all albums sold in 2015. That percentage is greater than any record released this millennium, and while it sounds like a small number, remember that this data counts all albums sold from any artist. In terms of actual physical CDs sold, 25 was still in the lead, and in fact, the album that spawned the gargantuan worldwide hit “Hello” was responsible for 4% of all CD sales." The absolute numbers may not be in "Thriller" territory, but in terms of industry impact, that is an astounding achievement. And note that is just for 2015. This was the 2016 Grammys, which means she racked up even more sales and impact. And in the much-diminished music business of 2017, that means a lot. Beyonce made a record that made a big splash. She did an entire "video album" filled with provocative imagery which slotted nicely into the ideology of her fans, who felt it made a statement. As of today, her album "Lemonade" can still only be streamed on TIDAL -- it is not available on Apple Music or Spotify, the two largest streaming services. This almost certainly contributed to the lower sales and lower recognition. Perhaps more importantly, The GRAMMYS are lame. They always have been, and they probably always will be. Complaining about the Grammys selections is like griping that the mall doesn't have any cool indie stores. Duh. It's the mall. That's not what they do. If you're looking for cool or cultural relevance or good taste, you are not going to find it there. None of us should be looking to the Grammys for any kind of artistic validation. They are meaningless, and largely driven by industry insiders who are paying attention to things like how well the record was engineered or the marketing campaign or, yes, raw sales. I see this as part of a trend in the culture. Today, people demand that institutions, power structure, and "the man" support or pay tribute to their ideology. This is a contrast or change from a few decades ago when people simply ignored the institutions and power structure and created their own DIY systems and structures for validation. Put another way, we didn't go the mall, we started our own cool indie shops. But now, people demand the mall be cool. I'm not sure which is more righteous, effective, or "correct". I do know that I listened to both albums by A & B, and I thought they were perfectly competent, enjoyable representations of what pop music sounded like in 2016. I did not buy either one, and I have no desire to hear either of them again.